If you have ever thought of including a Kabuki Drop for your show or event and done some research, you probably know that it is not a cheap investment, whether you buy or rent a system. The benefits of buying a Kabuki Drop from a manufacturer is that you are investing in a professional system. A professional system means it has been developed with expertise, research & development, prototyping, time and resources. You are generally guaranteed a better system than one you could build in a few days. But, understandably, it comes with a higher price. You will likely only buy a system if you are going to use the Kabuki Drop on a regular basis or have a venue that you would like to install the Kabuki Drop in as a permanent special effect fixture. As always, the first step is to research what options are available to you. Professional systems can include manual and electronic Kabuki Drops. Get some basic understanding of the different types of systems on the market and compare their pros & cons. Some systems may be elaborate and can be controlled digitally through a DMX control board but require a long set-up time and are expensive. Some systems are very basic but inexpensive. Some systems may be lightweight and pack small while some systems require ATA cases to transport the equipment safely. Some systems are very easy to set-up while some may require a bit more expertise and experience. Be sure to select a system that suits your needs and not one that seems the most expensive or has the most features. An alternative to an expensive Kabuki Drop system is to make your own DIY Kabuki Drop. 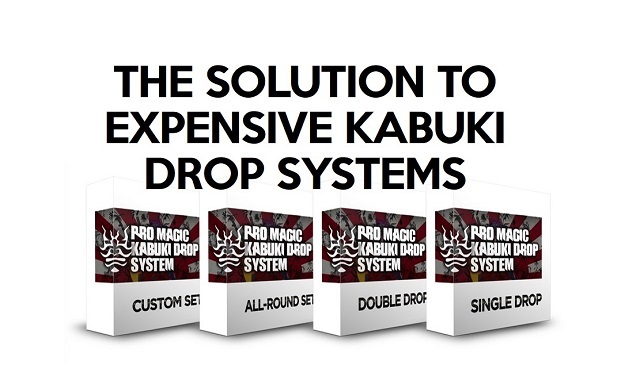 You can also check out the Pro Magic Kabuki Drop System, a low-cost, light-weight and reliable Kabuki Drop system for stage and event practitioners. It is a manual system so is a much smaller investment and is ideal for smaller venues, theatres, events and shows.